The primary adult data in this report come from a Pew Internet Project survey conducted from April 29 to May 30, 2010. The most current teen data reported here is from a separate Pew Internet survey of teens and their parents conducted from June 26 to September 24, 2009. Data points for some activities, however, come from earlier surveys, as shown by the following table. Getting news online: For adults, this question was “Do you ever use the internet to get news online?” (January 2010). For teens, this question was “Do you ever go online to get news or information about current events or politics?” (September 2009). 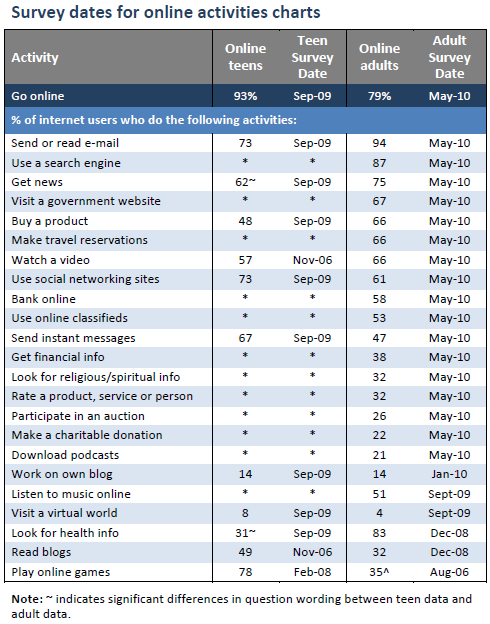 Looking for health information: For adults, this number indicates the percentage of internet users who said they had looked online for information about one of the health topics we asked about, ranging from information about a specific disease, a certain treatment, alternative medicine, health insurance, doctors, hospitals, and ways to stay healthy (December 2008). More information is available in our 2009 report, “The Social Life of Health Information.” For teens, the question was, “Do you ever look online for health, dieting, or physical fitness information?” (September 2009). For more information about all of the questions on both teen and adult surveys, as well as other details about wording and methodology, please see the individual toplines for each survey. The relevant portions of these surveys may be downloaded as a PDF here, or in the “Explore survey questions” section (“Download”) on the report overview page. The most current teens data in this study is based on the 2009 Parent-Teen Cell Phone Survey which obtained telephone interviews with a nationally representative sample of 800 teens age 12-to-17 years-old and their parents living in the continental United States and on 9 focus groups conducted in 4 U.S. cities in June and October 2009 with teens between the ages of 12 and 18. The survey was conducted by Princeton Survey Research Associates International. The interviews were done in English by Princeton Data Source, LLC from June 26 to September 24, 2009. Statistical results are weighted to correct known demographic discrepancies. For more information about the sample of 12-17-year-olds, please see the Methodology section of the “Teens and Mobile Phones” report (2010). The full data set is available at https://www.pewinternet.org/Shared-Content/Data-Sets/2009/September-2009-Teens-and-Mobile.aspx. The Parent and Teen Survey on Gaming and Civic Engagement was conducted from November 1, 2007, to February 5, 2008. The margin of sampling error for results based on teen internet users is ±3%. The full data set is available at https://www.pewinternet.org/Shared-Content/Data-Sets/2008/February-2008–Teen-Gaming-and-Civic-Engagement.aspx. The Parent & Teen Survey on Writing was conducted from September 19 to November 16, 2007. The margin of sampling error for results based on teen internet users is ±5%. The full data set is available at https://www.pewinternet.org/Shared-Content/Data-Sets/2007/November-2007–Teens-and-Writing.aspx. The Parents & Teens 2004 was conducted from October 26 to November 28, 2004. The margin of sampling error for results based on teen internet users is ±4%. The full data set is available at https://www.pewinternet.org/Shared-Content/Data-Sets/2004/Teens–Parents-2004.aspx. These and other data sets are also available on our data sets page. This report is based on the findings of a daily tracking survey on Americans’ use of the Internet. The results in this report are based on data from telephone interviews conducted by Princeton Survey Research Associates International between April 29 and May 30, 2010, among a sample of 2,252 adults, age 18 and older. Interviews were conducted in English. For results based on the total sample, one can say with 95% confidence that the error attributable to sampling and other random effects is plus or minus 2.4 percentage points. For results based Internet users (n=1,756), the margin of sampling error is plus or minus 2.7 percentage points. In addition to sampling error, question wording and practical difficulties in conducting telephone surveys may introduce some error or bias into the findings of opinion polls. New sample was released daily and was kept in the field for at least five days. The sample was released in replicates, which are representative subsamples of the larger population. This ensures that complete call procedures were followed for the entire sample. At least 7 attempts were made to complete an interview at a sampled telephone number. The calls were staggered over times of day and days of the week to maximize the chances of making contact with a potential respondent. Each number received at least one daytime call in an attempt to find someone available. For the landline sample, half of the time interviewers first asked to speak with the youngest adult male currently at home. If no male was at home at the time of the call, interviewers asked to speak with the youngest adult female. For the other half of the contacts interviewers first asked to speak with the youngest adult female currently at home. If no female was available, interviewers asked to speak with the youngest adult male at home. For the cellular sample, interviews were conducted with the person who answered the phone. Interviewers verified that the person was an adult and in a safe place before administering the survey. 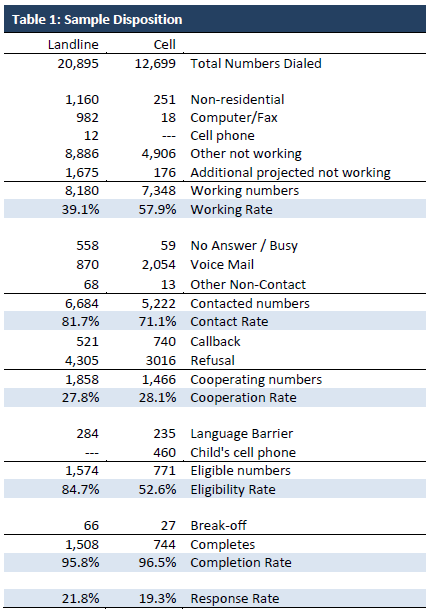 Cellular sample respondents were offered a post-paid cash incentive for their participation. All interviews completed on any given day were considered to be the final sample for that day. Thus the response rate for the landline sample was 21.8 percent. The response rate for the cellular sample was 19.3 percent. The full data set is available at https://www.pewinternet.org/Shared-Content/Data-Sets/2010/May-2010–Cell-Phones.aspx. This and other data sets are also available on our data sets page.